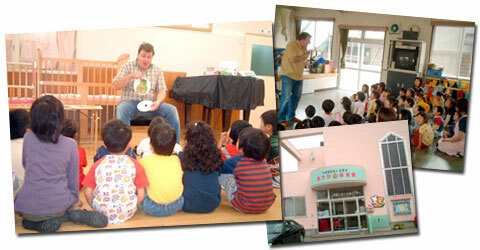 Our aim is for young children attending Japanese Day Care Centers to enjoy learning English. Under this program, KIDS Campus takes its ever-popular Preschool program out to local Day Care Centers. Children whose parents have difficult schedules are now able to experience the fun of learning English without leaving their Day Care Center. For parents who are interested in this program, please remember this program is not offered to individual children, but Day Care Centers. We warmly invite Day Care Center’s to contact us for a free consultation and demonstration lesson at your Day Care Center. KIDS Campus currently services 3 Day Care Centers. Classes are of varying sizes and our lessons are designed to meet the needs of the children and the Day Care Center. Typically, our lessons are arranged in 30 minute segments, however these lessons may also be arranged to meet the needs of the Day Care Center. Children learn English through a variety of play, songs, art, texts and materials. Day Care Centers may negotiate a time for one of our experienced teachers to come and teach students. Lessons are typically 30 minutes. However, longer lesson periods may be negotiated. For children who attend Japanese Day Care.